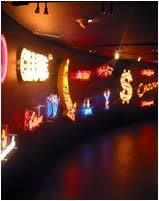 Bulb signs were the first illuminated signs long before neon. Bulb signs, using Carnival bulbs, Festoon bulbs or LED's are a great way to attract attention with static or flashing bulbs formed into letters or shapes. Manufactured to a high standard, they can be supplied mounted onto built up letters or flat signage to give visually stimulating effect. Check the gallery or below for ideas.